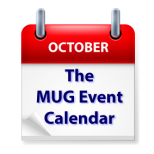 A Macworld Senior Editor appearance tops this week’s MUG Event Calendar. Christopher Breen of Macworld will visit a California group, a Florida group will focus on digital traveling, and a Connecticut group will discuss the Internet of Things. Other topics for the week include iOS 8, digital disaster, Yosemite, security, graphics and more.